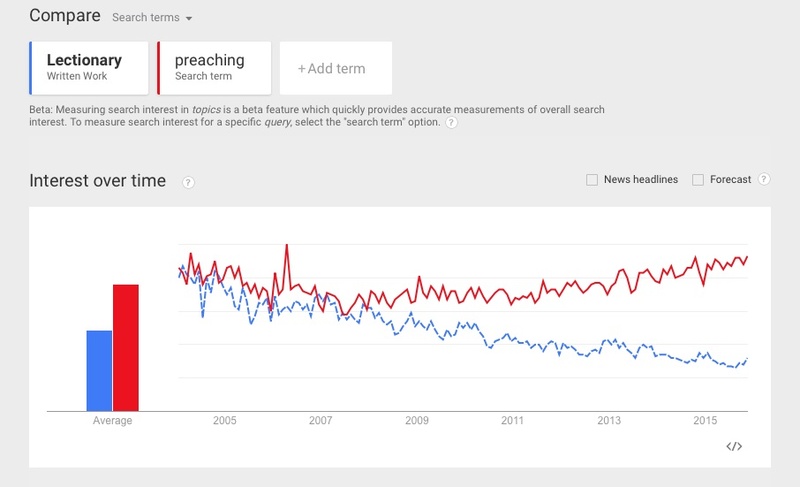 I think a reply to Steve Thorngate may be in order where the Old Testament selections in Year D are concerned. By conceding that a greater degree of subjectivity may well be involved in making these selections, I simply meant that this is an inevitable result of having to work from a much broader field of possibilities as we find in the larger testament. I did not mean to suggest these were purely subjective selections. Readers should not overlook the textual evidence of literary and thematic connections between Old and New Testament passages that I have identified and enumerated in Chapter 4. Perhaps I should also add that, in suggesting a fresh body of gospel texts, other than the familiar and well used narratives, for the high holy days, I am not suggesting the preacher neglect the story, but that these alternative texts can lend a new revelatory angle on the familiar story that, owing to the occasion, is (for many people) already in mind. Check out this substantial piece by Steve Thorngate over at The Christian Century on lectionary expansion proposals. He gives a good bit of space to Year D, the Narrative Lectionary, and the African American Lectionary. It's a major article that took a good bit of time and labor to pull together. I'm grateful to Steve for the write up (despite some of the finer points on which we may disagree). UPDATE: I was sorry to see Steve's piece made no mention of David Ackerman's book, my review of which can be found here. ANOTHER UPDATE: But now I see David's book is mentioned along with a number of related sources in the bibliography, "A Wealth of Lectionaries," that Steve attached to his article. The third chapter of Hebrews is essentially a discourse on faith: the faithfulness of Jesus as the Son of God (vv. 1–6) and a call to faithfulness on the part of the reader or hearer of this homiletical epistle (vv. 7–19). The first word, "Therefore," however, obligates us to search for the antecedent in the previous passage (2:5-18). Much of that passage concerns how Jesus fulfilled his mission: his temporary subordination (of a sort) to angels, his suffering, and his death "for everyone" (v. 9); indeed, his suffering even seems to have served his perfection, who is here for the first time termed the pioneer, and who is identified as one who sanctifies (v. 10), a task we normally associate with the Holy Spirit. But this raises the still more immediate issue of what Jesus has done, and that sanctifying or purifying work is stated most plainly in this "why" statement of purpose: "so that through death he might destroy the one who has the power of death, that is, the devil, and free those who all their lives were held in slavery by the fear of death" (2:14–15); furthermore, this liberating work (we should also note) serves God's purpose of "bringing many children to glory" (2:10). Again, the apostle reiterates the fact that Jesus' solidarity with his flesh and blood brothers and sisters in suffering — the how of his abasement — was necessary in order to "help those who are being tested" (2:18). But the what of his liberating mission is likewise restated in terms of his purifying, high priestly calling: "so that he might be a merciful and faithful high priest in the service of God, to make a sacrifice of atonement for the sins of the people" (2:17). With this complex description of Jesus' faithfulness as high priest, suffering pioneer, purifying atonement, and liberating destroyer of death, we may proceed to the discourse on faith, and having done our contextual work, it is easy to see how Moses' faith may be at once affirmed as that of a household servant and prophet of the things to come (vv. 2, 5), yet allowed to diminish in comparison to the faithfulness of Jesus, whose sonship is once more asserted, but now with an added layer of metaphorical complexity. With the introduction of the phrase "in all God's house" the apostle would almost seem to have the covenant with David in view, in which the LORD promises to build David a house; this everlasting Messianic covenant with David is not mentioned here, except perhaps by inference, but according to its assigned metaphorical roles, God is the builder of the house, and the promised Son of God/Son of David is the house itself (or so it would seem). Here, however, Jesus is both the builder (v. 3) and the Son of the builder (v. 6) whose faithfulness "over God's house" entails his headship, lordship, and oversight (such as we encounter in the Christology of Ephesians and Colossians)—all of these roles and functions far exceeding that of the household servant (Moses) in glory. Jesus' servanthood is no basis for comparison to Moses, for that is but one dimension of the Son's comprehensive and multifaceted identity, which here includes his administrative relationship to the house, the building from God (2Corinthians 5:1), of which we as his brothers and sisters are a part (v. 6). If one sits with this repository of Christological metaphors long enough, a similarly rich ecclesiological complex eventually presents itself at their marvelous nexus, that is, where the identity and coherence of the body or house derives from the head, while dexterity is expressed in the broader structure. What we should not miss, as we turn to the call to faith (vv. 7-19), is the sense in which the architectural and biologic-somatic metaphors are oddly conflated here, yet in a manner that is fully consistent with similar Petrine, Johannine, and Pauline expressions: the house is made of living stones (1Peter 2:5); the temple is the body of Christ (John 2:21); the members of the church are members of his body (Ephesians 5:30; 1Corinthians 12:12, 20). With the turn to ecclesiological application, the homilist of Hebrews urges faithfulness upon his readers/listeners; they (and we) "have become partners of Christ" (v. 14) and should therefore exhort and encourage one another daily (v. 13). But each if these positive assertions are deeply nested, indeed, are almost overwhelmed here by warnings against unfaithfulness. The prospect of partnership is conditional: "if only we hold our first confidence to the end" (v. 14); exhortation is to serve as a check against the hardness of heart brought on by "the deceitfulness of sin" (v. 13). The remainder of this chapter consists of a cautionary reminder that recalls the tragic episode of Israel's rebellion under Moses whereby an entire generation of those set free from slavery in Egypt died in the wilderness without entering the promised land, the promised "rest." The focus of the apostle's exhortation is Psalm 95:7–11, which (despite its function as a conditional stipulation here) eventually serves to remind us that, for all the time that has lapsed since that ancient rebellion, "the promsise of entering (God's) rest is still open" (4;1). For the time being, however, in the text before us, it is the stick, not the carrot, that lends rhetorical incentive: do not put God to the test (v. 9) or go astray in your hearts (v. 12); do not harden your hearts (v. 8) or turn away from the living God (v. 12); for such an unfaithful, disloyal, "unbelieving heart" is "evil" (v. 12). Meanwhile, this entire caveat, strong as it is, does not condemn blindness or senselessness for which people may be found faultless; rather, it speaks to a very particular existential experience: "Today, if you hear his voice ..." (vv. 7, 15). Israel, of course, had not only seen the delivering miracles and signs of God in Egypt, at the Red Sea, and in the wilderness; they had also heard the fearsome, unmediated voice of God at Sinai, where centuries later Elijah would discern it as "a still, small voice" or "the sound of sheer silence" (1King 19). Whether loud or soft, whether through a human mouthpiece or from on high, whether in the voice of the conscience or the stillness of one's heart, ... the voice of the LORD, when heard, is to be obeyed, not stiff-armed or rejected in a diversionary turn to sin. Neither is it to be tuned out, for all such forms of rejection and avoidance only serve to dull one's spiritual sensitivities and will eventually lure one into regions where no hope of rest shall ever be found. Here, as everywhere, these warnings would direct us to the narrow gate, Jesus Christ, the way of obedience and faith, through which, through whom alone, we may gain access to God's promise of rest. The prologue to the Epistle to the Hebrews (1:1–4) is one of a handful of such texts (cf. John 1:1-18; 1John 1:1–4; Ephesians 1:1–14; Colossians 1:15–23) that speak of the pre-existence of Christ, and on that score alone it should be regarded as a deep, clear source that invites repeated, even continual, contemplation. It also lends such rich and vital literary context to what follows that it really should be included in any exposition of these subsequent verses (1:13—2:4). Since we are focusing, however, on material excluded from RCL, we take up with the conclusion of the supra-angelic excursus (1:5–14), where a final proof text (1:13) is cited to support the apostle's assertion that the Son of God (and his name) is immeasurably superior to the angels (and their names) (1:4). This final proof text is particularly significant, hence, its position as a rhetorical coup de grâce (and hence the inexplicability of its exclusion from RCL), in that it speaks not only of the Son's relationship to the Father (or in the original psalm setting, the LORD), but of his enthronement at the right hand of the LORD, elsewhere "the right hand of power" (Matthew 26:64); moreover, the chosen verse is taken from a psalm that testifies to this favored one's priestly role according to a new, yet pre-existent (non-Levitical) order, the order of Melchizedek (Psalm 110; see also First Sunday of Christmas). This priestly role will be the focus of a lengthy exposition in Hebrews 4—10. Here, however, the seating of the Messianic Son, with his enemies converted (comically) into a footstool, clearly refers to the "rest," or the sitting down, of the Son of God after his great work whereby he "made purification for sins" (v. 3). By this work of purification, we mean, of course, no merely human labor or mundane task among many others, but the central work of redemption history, "the" work on which absolutely everything— every hope of salvation, renewal, restoration, reconciliation, the continuation of life itself—depends. Thus, where the prologue speaks of God's revelation through the Son, the Son's sovereign appointment as "heir of all things," his mediating role in creation, his glorious character, his equality with God, his power to sustain all things, his great work of purification, his incomparable superiority to the angels, and his heavenly enthronement, the conclusion of the excursus (1:13–14) and the summons to "pay greater attention" clearly assert that what is at stake in our doing so, in our attending to the revealing word and the atoning work of Christ, is our very salvation, the salvation in the service of which the angels themselves labor (v. 14). So "great" is this salvation that, were we to "drift away from it" (2:1), forget or "neglect" it, there would be no escape (2:3). Threatening as this may seem, the logic is as simple and straightforward as possible: how can one escape when one refuses the only means of escape? And if anyone is in doubt as to the greatness and comprehensiveness of this salvific means of escape (i.e., the Son of God and his purifying work), the apostle assures us (or takes as an utterly reliable presupposition) that, according to this Christological (and perfectly logical) revelation and his atoning work, "every transgression (and) disobedience (have) received a just penalty" (2:2). What incomparably good news! As for the certainty and reliability of all this, we are reminded that this is the message of God himself, who has not only spoken it (1:1) through various messengers, but also attested to it by way of additional "signs and wonders and various miracles, and by gifts of the Holy Spirit" (2:4). This means of escalating divine authority and assurance will be mentioned again very explicitly when the epistle speaks of God's sworn promise to Abraham (6:13). Though less explicit here, the same (at very least) doubling of the divine assurance is clearly indicated: the revelation of salvation comes from no less than God himself, and God himself has sworn to it repeatedly. 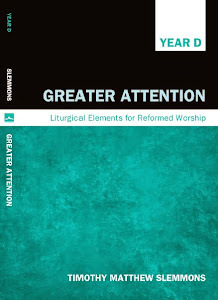 With so much at stake then, and with such unimpeachable solid ground on which to trust it, the demand for "greater attention" on our part is—or it should be—absolutely riveting. The Psalm assigned for the 27th Sunday of Ordinary Time is Psalm 41, for its associations with the Last Supper, the gospel accounts of which are suggested for World Communion Sunday. The opening section of this psalm (vv. 1–3) asserts in general terms that the LORD blesses, delivers, protects, keeps, preserves, sustains, and heals "those who consider the poor." Such merciful people "are called happy in the land" (v. 2), for despite the many troubles from which the LORD preserves them, the assumption is that they will face them for a time — yes, they will have troubles, they will have enemies, they will fall ill on occasion — but the LORD will ultimately guard them and show them favor, and they will enjoy a good reputation as those who are so blessed. With the phrase, "As for me ... " (v. 4), the psalm takes a decidedly specific and personal turn, and the focus remains on the psalmist and his circumstances until the final verse. What is remarkable in this section is the sense in which it is framed between, on the one hand, a plea for gracious healing, the rationale for which is a confession of sin against the LORD (v. 4), and on the other hand, a reiteration of the plea (with the expressed desire to "repay" the psalmist's enemies) attached to a word of self-assurance that the LORD must be "pleased with" the psalmist, and indeed has "upheld (him) because of (his) integrity" (vv. 10–12). The memory of the psalmist's confessed sin has receded entirely, and in fact the assurance is pregnant with eternal significance, for the LORD (sings the psalmist) has "set me in (his) presence forever" (v. 12). In between the confession and assurance, an extended complaint (vv. 5–8) describes the conduct of the psalmist's enemies who visit him in his illness. What is startling about this description is the psalmist's characterization of the enemies' malice and their inwardly hostile motivations: "their hearts gather mischief" (v. 6), as compared to the description of the enemies' actions, which appear relatively benign and mundane. These enemies, unlike those in other psalms, do not ambush the psalmist or seek to murder him, but they simply wonder when he will die; their attempts at comforting words are "empty" and they go away gossiping. Their hostile actions consist of "thinking" the psalmist will soon expire (v. 8), of spreading the news of his condition "abroad" (v. 6) — no doubt in unduly pessimistic terms — and of whispering together: the kind of thing that occurs all the time in hospitals and nursing homes. It is even difficult to distinguish some of these actions, externally speaking, from the common practice of sharing concerns among the community of faith. Hence, in light of the sense in which the inward attitude is altogether decisive here, this psalm should stand as a cautionary tale for anyone who renders pastoral care or attends upon the sick. One closing word of complaint escalates the psalmist's sense of betrayal, since he perceives the same conduct and hostility in his bosom friend who has "lifted his heel against me" (v. 9). This verse is taken up in the New Testament in association with the betrayal of Jesus by Judas Iscariot, as the phrase: "who ate of my bread" (v. 9b) is connected with Jesus' identification of the the one who "dipped his hand into the bowl with me" (Matthew 26:23; par. ), an action that connotes a clear lack of respect and deference, or even a brashness akin to that of Esau who exchanges his birthright for some stew. The phrase "lifted the heel against me" clearly signals more than a mere departure, or a turning of one's tail (so to speak), but a traitorous turning away that amounts to permanent renunciation, an irreversible rupture of friendly companionship. Nevertheless, from all this, the LORD delivers the psalmist such that his assurance is certain, his vindication is declared, his confession is (largely) forgotten, and the psalm ends with a doxological outburst (v. 13), blessing "the LORD, the God of Israel from everlasting to everlasting," and concluding with a double "Amen." Thus ends the first book of the Psalms. This is the first Old Testament lection assigned to Year D, i.e., for the First Sunday of Advent. Chosen primarily for the latter and larger portion (1:6-14) of this chapter, the whole chapter (1:1-14) has nevertheless been suggested. The opening section is admittedly difficult, contrasting the LORD's love of Jacob with his hatred of (or judgment against) Esau (Edom). If there is a ray of hope in this stark and startling text, it is surely in the conditional clause: "If Edom says, '... we will rebuild ...," only then will the LORD tear down "until they are called the wicked country, the people with whom the LORD is angry forever" (v. 4). In other words, the threat of irreversible divine anger is not a certainty for Esau, but is conditional, based on whether Esau repents of rebuilding (i.e., resisting and refusing to accede to God's judgment). Perhaps this thorny opening passage may be best treated in conjunction with Romans 9:13 (see 28th Ordinary), but such an inflammatory text should not be introduced without a word of hope, and in this case, as in the New Testament generally, the Lord does not want "any to perish, but all to come to repentance" (2Peter 3:9), a major theme of Year D.
More to the point for the Sunday in question, the oracular ministry of Malachi generally and the closing section of this chapter specifically (1:6-14) raise Advent themes on a number of levels. Broadly speaking, Malachi ("my messenger") forecasts the coming of the preparer of the way (3:1a; cf. Isa 40:3), and the sending of Elijah as the forerunner "before the great and terrible day of the LORD" (4:5). More narrowly, 1:6–14 raises the issue of a corrupt priesthood that habitually offers corrupt sacrifices of damaged, blemished, imperfect, and lame offerings from the flock. This in turn provides a fitting framework for the priestly and sacrificial focal points of the gospel and epistle lections, both in terms of their strictly human counterparts in Zechariah and John, and their fulfillment in the coming Messiah as holy lamb for the atonement and high priest in the order of Melchizedek. The First Sunday of Advent is often an occasion for the celebration of the Lord's Supper, thus, the surprising reference to "the Lord's table" being polluted or profaned (v. 12) should invite (at very least) an attitude of self-examination; while the threshold of a new liturgical year serves as a fitting occasion to invite the people of God to offer a pure, whole, and whole-hearted thank offering to the LORD, with the reminder that the Messiah himself has gone before us and offered just such a perfect human offering on our behalf and modeled such worship for us to imitate. 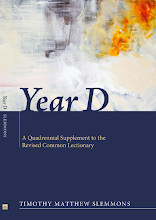 Just sent in an article on Year D to The Lutheran Forum, a print journal (where the current issue has a feature piece on "St. Søren Kierkegaard"). Thanks to Sarah Wilson for the invitation to contribute and place the prospect of lectionary expansion before our Lutheran brothers and sisters. I'll let you know when the article hits the press. Meanwhile, thanks be to God for each opportunity and each new denominational communion that is willing to consider including more of the written revelation in the preaching of the church, "that the Word of God may be fully known."